There are many rue recipes out there, and it is not for naught. If you have had the chance to taste a soup or sauce containing this agent, you would understand why so many people have an interest in this food. This thickening agent is not only prevalent in professional kitchens where chefs do their best to bring out flavors in sauces, but it is also a norm in many home kitchens. It is the backbone of many a sauce, soup, and dishes across the globe. So great is this thickening agent that people out in battle would use it to add some flavor to food that had otherwise gone bad and they would enjoy their meals and continue with the struggle feeling replenished. I have to admit that I too have used it to deal with wayside foods when out camping and the results were fantastic such that no one who ate the food was the wiser. 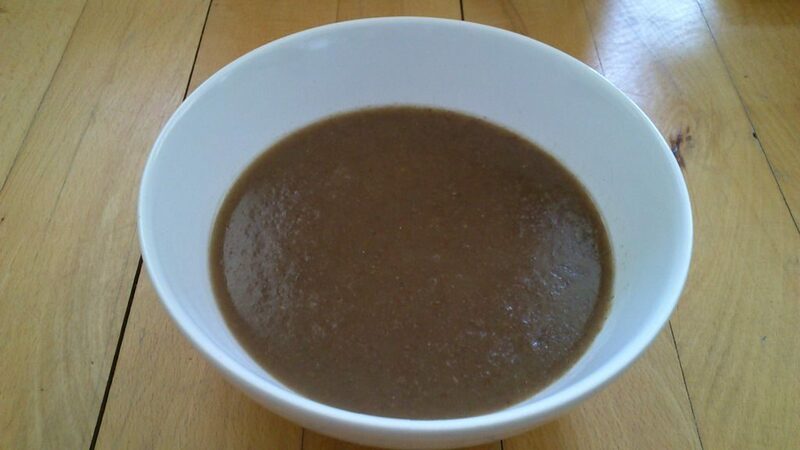 Foods with roux have that undeniable nutty flavor that combines with the silky-smooth nature of the agent to bring out different tastes that make a meal whole. It adds body to even the simplest of meals. Given how beneficial it is, you would think that a roux recipe would be quite complicated, but this is not the case. Check out ways in which you can craft this dish, how to use it as well as how to store it. Enjoy! While it may be clear by now that people use this agent to thicken their sauces and soups, there is much more to this dish than meets the eye. Making this dish involves two ingredients which you probably already have in your kitchen. The basic roux ratio involves combining equal parts of flour and fat and cooking them until the flour loses its raw flavor. You should also pay attention to the color depending on what you wish to use the roux to do. 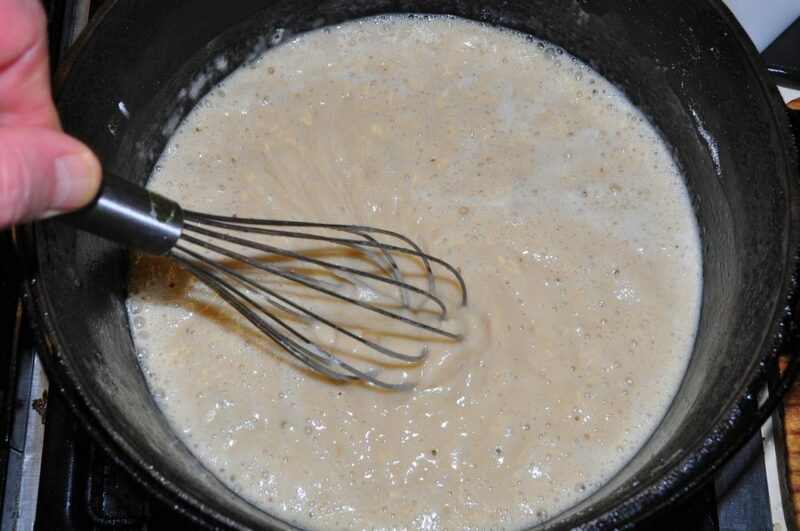 When it comes to the fat, it again depends on what you want to use the roux to do. Most people use butter as do I. However; you do not have to limit yourself to this option. You can use oil, bacon grease or other rendered fat if you have these instead of butter. Go for butter if you need to make a trip to the store to get fat and get the clarified type if you plan to use the roux for a long time. Once you store it in the fridge, it will trap the flour in suspension. When you take it out, you will not have to deal with lumps when whisking it in a sauce as you would when dealing with other kinds of fat. I am one for making a dish that will last me through weeks or months if I can, and I always go for clarified butter. In this way, I know that I can use my roux when making everyday meals which can do with a little more thickening. When it comes to making a roux, you have many options which all serve different needs. There is no definite number of roux options as there are many hues available depending on how much time you spend on cooking. 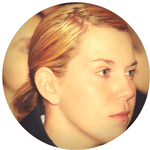 However, you can narrow down the alternatives regarding the grades that are quite common. These colors are white, blond, brown, dark brown and brick. The difference in the hues comes about based on the time taken to cool the roux. If you do it for a short time, then you will end up with a white roux which is quite common. Let it cook a little longer, and you get blond roux which most people also enjoy. Much longer than this and you have the brown hue which bursts with flavors. And what do you get when you cook the roux for the maximum allowed time? That’s right! Dark brown roux takes the longest time to prepare and it is likely that you have not come across this type yet. You see, most people look to roux as a way to thicken their chowders, soups, and sauces and the thing that comes to mind in such cases are the blond and white options. They have much more thickening power than their dark-hued counterparts. The brown and dark brown roux, on the other hand, have much more flavor than the light-colored ones. The downside to using them is that their thickening abilities are not as strong as those of the white and blond. However, they have much more flavor, and people use them in Cajun and Creole dishes. I like having both light brown and dark brown varieties around as I never know what I will be making the next day and I am big on saving time in preparation. And I know all too well how great jambalaya is with some dark roux in play. Yum! Whether you are making white, dark brown, blond, brick or brown roux, you will pretty much follow the same procedure save for when it comes to the cooking time. 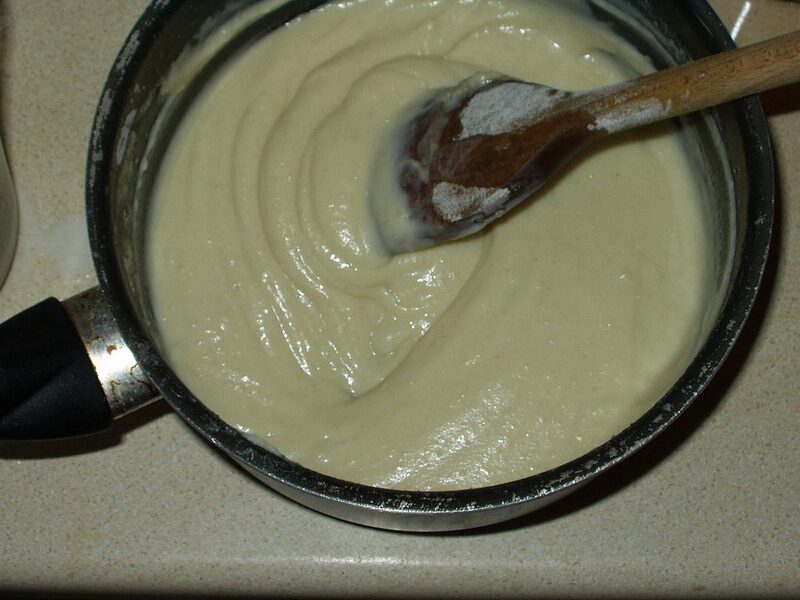 Here is a simple way to make a butter and flour roux. Gear up for the most straightforward recipe yet! For this recipe, the instructions will have their basis on clarified butter. If you choose to substitute this ingredient with an equivalent, the steps will remain the same, and you should have no problem with achieving equally fantastic results. If you ever wondered how you can thicken soup with flour, here is all you need to know. Start by measuring one cup of clarified butter. A little on top is a good idea to account for any losses during the cooking stage. Place a saucepan over medium heat and add the butter to it. Do not increase the heat and let the butter melt at this temperature to the point that it is liquid and appears to be hot. This process may take a while, but it is worth it in the end. Once the butter is hot such that any addition to it will lead to bubbling, you can now move on to step number two. You remember that I said that we make a roux by combining equal parts of fat and flour. 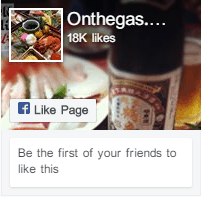 Well, this is not that kind of recipe as there are some variations as is the case with most of my recipes. However, I do not encourage you to make any changes in your first try as this could have disastrous results. You can trust me on this. For this step, you will need to measure 1.75 cups of flour which you will then proceed to pour into the hot butter. As you do this, ensure that you keep whisking the flour into the butter until you get a thick and rough paste. That’s how you know that you are on the right track. Continue combining the flour and the butter to get an even mix. Remember that this whole time that the saucepan is still over medium heat which you should not alter. 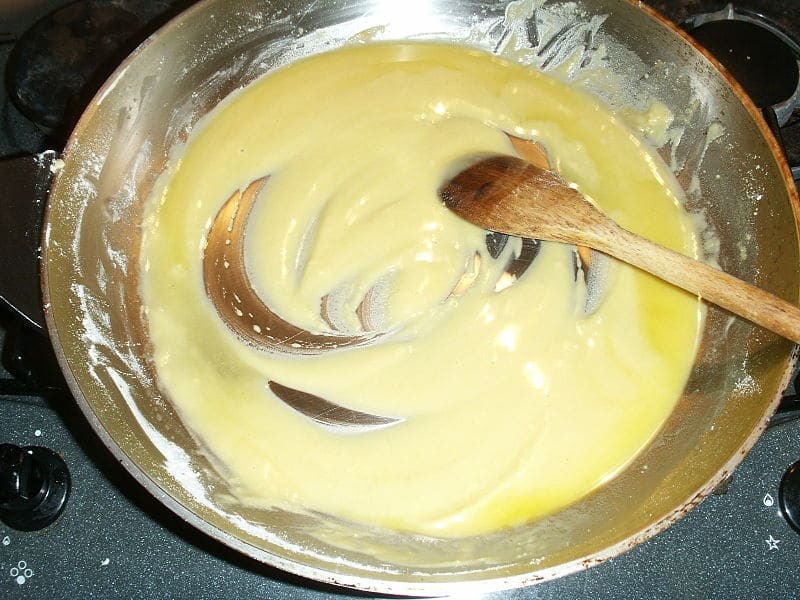 After a while, you will notice that the roux will attain a smooth paste. Continue whisking until it begins to thin. I remember that the first time I tried this and saw the mixture thinning; I almost lost it because I thought that I’d have to start over again. If you see this happening, know that you are almost there and keep stirring. If you have not been getting some cardio for a while, then this is a good time as any to get your heart rate going. I’m only saying this to encourage you to keep stirring as you will be doing so continuously for at least five minutes as you work your way to the white stage. This point is that stage at which the flour loses its raw smell, and you can see visible changes in the mixture’s appearance. For one, though you can detect some grains in the mix, you will notice that it will be much smoother than it was at step 2. The mixture will also be bubbling at a faster rate than in the previous stages, and you will have to keep up with the stirring to keep things under control. The color too will change. If you compare it to when you first combined the flour and butter to the hue that you are now seeing, you will notice that it is much paler. You can always take photos when cooking to help you appreciate these changes. Just be careful that you don’t lose yourself to the photography session and forget about your roux. This dish is quite easy to mess up if you don’t watch the heat and the rate of stirring. That said, a few pics won’t hurt the process. Now comes the part when you will rely on your hands for everything they’ve got. You need to keep the temperature at medium and keep stirring and cooking for at least another twenty minutes. It sounds like quite a lot, but this is the only way you get to achieve the blond stage. It helps to have someone in the kitchen, and you can take turns in the stirring if it gets to be too much work. The appearance of the mixture at this stage will still have some grains in play if you pay attention. But they won’t be as noticeable as in the white roux. You will also notice that the bubbling will have reduced a great deal as compared to stage three and you are having a much easier time with the stirring. The scent of the mixture will also change. By now, the raw flour smell is no longer evident, and this will get replaced by an aroma like that of toasted bread or if you like, popcorn. It might take all you have not to stop at this stage and get the roux in some soup. The smell is delicious. The color too will change to a lovely tan, and you will notice that the texture is quite smooth. On seeing these changes, you will know that you are getting close to the brown stage. The mix will also be much thinner than at step 3 and the longer you keep stirring; the closer you get to a less thick mixture. 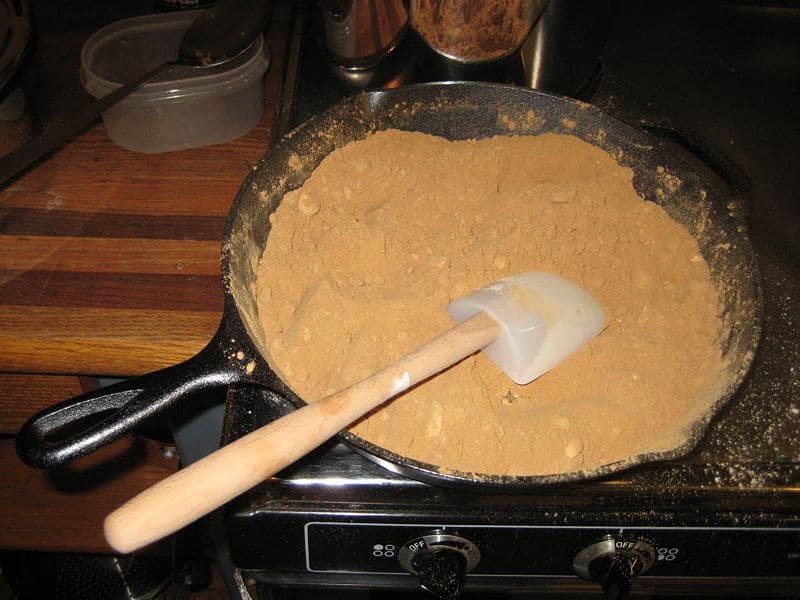 If you want a brown roux, keep cooking and stirring for another fifteen minutes, which will bring the total cook time to about thirty-five minutes. As long as you do not alter the temperature, the cooking will result in a much thinner mix with a brown color like that of peanut butter. Additionally, the aroma will drive you crazy with its gratifying air. 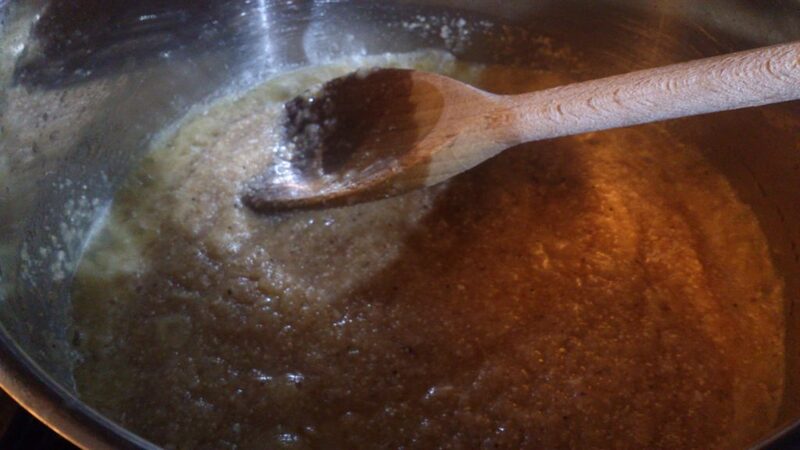 The bubbling will have reduced a great deal, and you will notice that the texture is much smoother and that the mix is thinner than in the previous stage. At this stage, the flavors are more prominent than in steps 3 and 4, but it’s not as good at thickening as the prior mixtures. Let’s make a homemade roux for some excellent jambalaya by getting some more cardio to the routine. Forty-five minutes of cooking and stirring will result in a very thin mixture with a melted milk chocolate hue. The aroma derived from the roasted flavor of brown roux is quite strong and appealing. It smells like chocolate to a given extent, and it is a sure way to get your stomach juices pumping. At this point, the bubbling will have stopped, and you’ll know that you made it to the dark brown enviable hue that serves many a purpose. There are some things that you need to keep in mind to achieve a dark brown roux. First off, you should take it off the heat before the forty-five minutes are over. In this way, it will keep cooking under the moderate heat for a while before the time elapses. This step is significant especially when you are using cast iron to avoid a case where the roux keeps heating after taking it off the heat due to carryover heat. This step is essential for all kinds of roux as it enables you to put an end to the process which can alter the color and flavor of the mix. The second thing to note is that there is another way that you can slow down the cooking process without having to take the pan off the heat. However, this step only applies to a dark brown roux. Suppose that you are making gumbo, adding some vegetables to the mix will slow down the cooking and you will not end up with an altered roux. The third and most important thing to note when making this kind of roux is that you have to be cautious. A drop of this on your skin will burn you. Do not attempt to taste or touch it while hot and it’s best to keep kids away from the kitchen while making this. Though fat makes up for half of what you would probably use to make a roux, there are cases where you may want to make a fat-free thickening agent. It could be for health or out of preference, but whatever the case, it is possible. I should warn you though that the results will not be as tantalizing as what you would get from using fat as there won’t be as many flavors in play. However, the thickening power will be visible. For this recipe, you will require one cup of flour. It could either be all-purpose white or whole flour. You can use a cookie sheet, iron pot or baking pan for this. Start by lining the bottom of the pan with flour about an inch thick. Bake the flour at four hundred degrees for about 1-1.5 hours. It’s always best to let the flour cook for the maximum allowable time to give it some flavor, but this all depends on you. As it cooks, be sure to stir regularly and incorporate the flour from the corners and the edges to that in the middle. You will notice that the flour will change in tone to a light brown or a much darker color. Once you add water to the flour, you will notice that the resultant color will be much darker than that it shows at this point. Take out the amount of flour you need to make your roux and store the rest in a zippered bag such that you will have enough for other recipes. Take the portion that you will use and add in cold water gradually until you achieve a smooth paste. You can now use this paste in your dishes. Ensure that you cook it in for at least twenty minutes while continually stirring and the results will blow your mind. When preparing a roux, it is quite easy to get carried away by the different colors that you end up forgetting why you were making it in the first place. While a brown hue may be beautiful, this kind of roux may prove incompatible with the dish that you have in mind. Making this type of roux is very easy, and you’ll finish doing so in about five minutes, which means that it is less strenuous on your hands as compared to the other variations. You cook the butter and the flour until you can no longer smell the raw scent of the flour. However, you must be fast when doing so. You want to ensure that you stop the heating immediately the roux no longer exhibits a flour aroma and just before it begins to change from pale to a golden color. You also want to get it right before it starts developing a toasted aroma scent. If you let it cook past this stage, then you will be dealing with a blond roux which has less thickening abilities and much more flavors. There are many ways in which you can use this roux. I like using it when thickening milk-based sauces as well as chowders which taste amazing as a result. You will find that there is a range of dishes whose basis is milk with a little white roux in play. Examples include macaroni and cheese, New England clam chowder and tuna noodle casserole. Baked potato soup also comes out great with some white roux. If you wish to make the above dishes or related ones, then white roux is the thickening agent for you. While white roux is quite simple to make and helps in thickening a wide array of dishes, most people opt to use a blond roux. Though it is much thinner when compared to the later, this thickening agent boasts of amazing thickening power coupled with definite nuttiness. It also has an aroma of toasted bread which some people refer to as a popcorn scent and a beautiful golden-brown shade. This commonly-used roux will take up about twenty minutes of your time, and you can use it in stews, sauces, gravy, and soups. Examples of compatible dishes include tomato soup, chicken gravy, and pepper steak. This roux exhibits an appealing peanut butter brown hue, and you will cook it for about thirty-five minutes to achieve its pronounced aromas. The prolonged cooking period reduces its thickening power, but it more than makes up for this loss by having incredible flavors. The good thing about it is that you can always use more roux to get the thickness you require. You can use it in steak soup, shrimp stew, vegetable chowder and gumbo amongst other dishes. People refer to its hue as melted milk chocolate and you should take about forty-five minutes to get this right. Its scent is not as strong as that of the brown roux, and it’s much like that of chocolate to some extent. 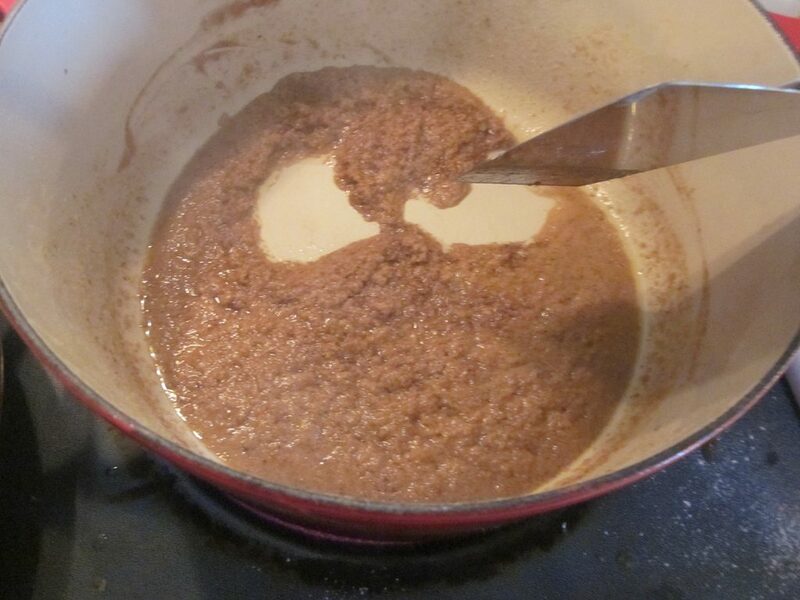 However, the brown roux cannot measure up to the flavors that this roux has. 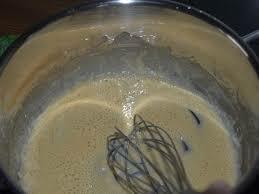 You will notice that this roux has very little thickening power when compared to the others. However, its primary purpose is to act as a flavoring agent with the thickening being a secondary function. When it comes to the best flavoring agent regarding roux, this is the way to go. Thanks to the considerable cooking time that it undergoes, this roux has little to offer regarding thickening power. However, when it comes to flavor, it has no equal. Some people feel that if you have not mastered the art of making this kind of roux, then you still have a long way to go when it comes to thickening agents. I feel some way about that too as it is the hardest roux to make. However, if you follow the instructions, then you should have no problem in making it. First things first, never leave the pan unattended. You see, unlike the other types, this roux is a small step away from burn roux. If you end up burning it, then you have to start over from the beginning which cannot be easy after coming all this way. Unfortunately, there is no way to salvage the situation. It goes by the name brick because it exhibits a reddish tone. Its scent is that of smoke mixed with nuts, and the flavor that it adds to dishes is out of this world. Once you get the hang of how to make it, you will start to appreciate how amazing it is. We’ve Learned How to Make, How About its Usage? 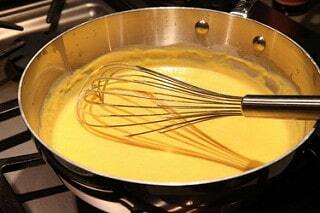 Once you make the roux, you cannot use it in thickening soup as it is and you need to add a liquid to it. Take for example that you need a white sauce for your dish. In this instance, you can add milk to the white roux, and you will have what you require. It may seem like a simple process, which it is, but there are some precautions that you must take while adding the liquid. 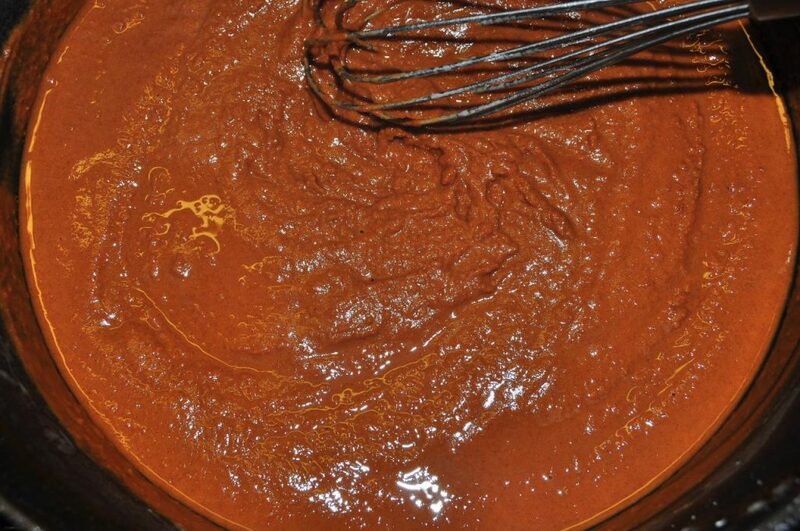 You should add cold or room temperature liquid to the hot roux while slowly stirring it to make a sauce. While adding the liquid, be sure to add a little at a time and whisk to a smooth blend before adding more. Once you get a thin paste, you can add the remaining liquid and bring the mixture to a simmer. The other option while doing so is by using cold or room temperature roux. Add it to a simmering soup gradually until it all dissolves. The essence to both these methods is to ensure that you get a smooth sauce that is free of lumps. You will notice that as soon as you add the liquid to the roux, the sauce will begin to thicken. However, you must allow the roux to cook at a moderate temperature for at least ten to twenty minutes. As it simmers, it will thicken more, and the flavors will begin to exhibit, thus ensuring that you get the most out of the sauce. The flour also softens during this process, and this enables it to absorb more of the liquid, resulting in a smooth sauce. You may get tempted to remove the sauce before the ten minutes are up but if you do so, the flour will remain grainy, and this will adversely affect the dish you make. I prefer making a lot of roux such that I can skip the preparation when making subsequent dishes. If you choose to go down this route, here are a few pointers to help you out. Take the roux and pour it into a baking sheet before placing it in the refrigerator to cool. You could also use an ice cube tray for this. Let the roux sit in the fridge for several hours until it completely hardens. I prefer leaving it overnight to ensure that it solidifies evenly. From here, you can let it sit in the fridge until the next use or transfer it to an airtight container in the freezer. Either way, it will keep indefinitely. If you make your roux with vegetable oil, you don’t have to store it in the fridge as it can hold in room temperature for many weeks before going bad. However, if you use butter or fat, you must refrigerate the remaining portion. There is a lot that can go wrong when making this dish and it is always good to have some pointers along the way. First and foremost, do not use aluminum pots when making the roux. As you are stirring and scraping the aluminum when cooking, the metal whisk will turn a light grey and will add a metallic flavor to your mixture. As a result, anyone who eats the roux will ingest some aluminum which has been shown to have adverse effects on people’s health. You should use a proper heavy pot during the cooking as this will prevent the burning of sauces which can happen after a prolonged cooking period. Be sure to take note of carryover heat by removing the pot from the heat before the cooking time elapses. Avoid the use of extreme temperatures when dealing with a roux. To start with, ensure that the roux you want to use is not colder than room temperature as this will lead to the solidification of the fat. It should also not be too hot as this leads to splattering once it comes into contact with the liquid and this can lead to burns. The stock that you are using should not be ice-cold as it will solidify the roux and pose issues when it comes to whisking. Do not get tempted to add more roux than stated to your dish. The full potential of the roux gets seen after the ten minutes or so are over. Adding more of it at initial stages could lead to over thickening which has disastrous results. You can use the reduction method if you plan on cooking your sauce for a long time. 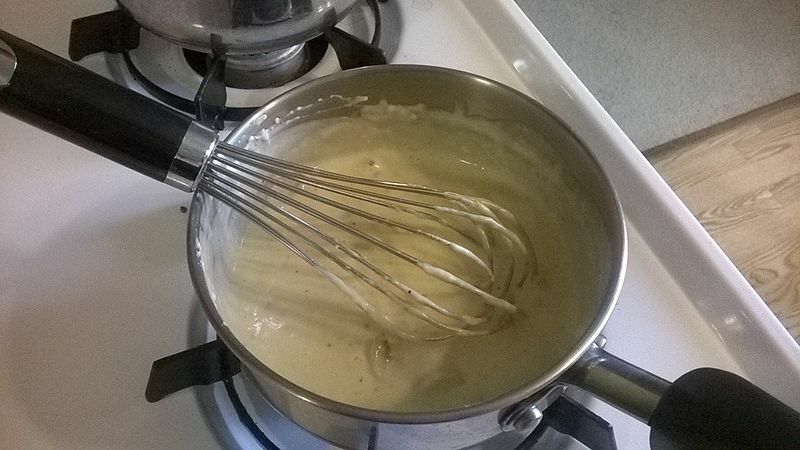 It is not for naught that roux sauce forms the foundation of three out of the five mother sauces. It owes to its excellent thickening power and tantalizing flavors. I hope that you enjoyed these roux recipe options. Thank you.